I absolutely love Barry M Nail polishes, the range of colours and quality of the polish for the price is great, for the bargain price of £2.99. I especially love the Ice Cream range which is a whole range of pretty pastel polishes, Berry Ice Cream - review here - will always be my favourite and to be honest, it's probably one of my all time favourite polishes, and believe me, I have a lot of nail polishes, but one that I'm loving at the minute is this Blueberry Ice Cream, a vibrant sky blue colour, this lasts a good 3 days without chipping and you could probably get away with applying just one coat of this, I applied two though just to be on the safe side. Finally, I used Sally Hansen Mega Shine top coat and away we go. I'm gonna do this colour again soon and do a silver tip, I think this colour would look amazing with Silver, so I'll post it up once I've done it! 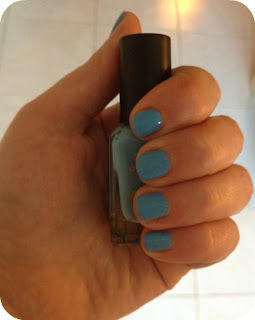 5 comments on "Barry M Blueberry Ice Cream"
i love barry m! you have now inspired me to dig out my bottle of this! :) lovely blog & great posts. 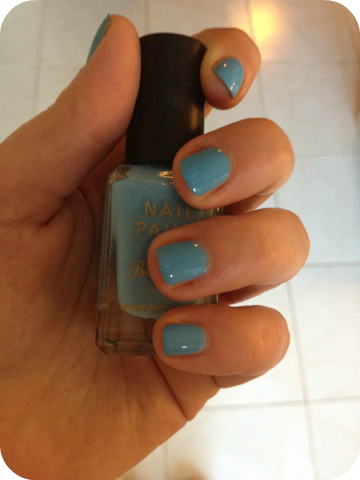 This is such a gorgeous shade of blue! I love this colour! Have you tried the new hi -shine gelly nails by barryM? I love them!